Testers: Matt Boyle, Zach Bush, Colin Djukic, Amy Gentry, Ramee Gentry, Al Golden, Duffy Holsapple, and Pablo Martínez Merino. Spring Thing 2011: 1st place of 6 entries. XYZZY Awards 2011: Finalist, Best Supplemental Materials (the Alamanac). Download TheLostIslandsOfAlabaz.zip from the IF Archive. Download TheLostIslandsOfAlabaz.zip from Spring Thing site. The Lost Islands of Alabaz - at IFDB. 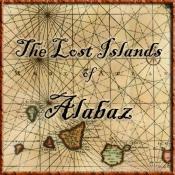 The Lost Islands of Alabaz - at ifwizz interactive fiction (in German). XYZZY Review for "Best Supplemental Materials" by J. Robinson Wheeler. This page was last modified on 27 October 2014, at 21:31.